Jake is our family's second German Shepherd. Jerry Lee, our first GSD passed away back in 2011. In april of 2012 we brought Jake home. Not a day goes by that he is not told that he is the best dog in the world. If you have ever wondered what true love is, get a German Shepherd. What an amazing breed of dog the German Shepherd is. Jake is loving, loyal, smart, but best of all OURS. You're absolutely right. Your Jake IS Handsome!! And German Shepherds are great dogs - especially when they are in the right home!! And your Jake is happy with his home I can bet, following in the shoes of his wonderful predecessor, Jerry Lee! I hope he has a long and full life with you and that he stays with you for many, many more years. Maybe in the future you can send us more details of what you have been doing, a few details on some of his adventures or exploits and loads more pictures or even videos of your German Shepherd Dog. We all love looking at all of those! And if you ever need any information about German Shepherds, we have you covered. Feel free to search through our site for German Shepherd training tips, articles about German Shepherd health and so much more. Thanks again! German Shepherds Rule!! Jake is a handsome boy, look at those ears! 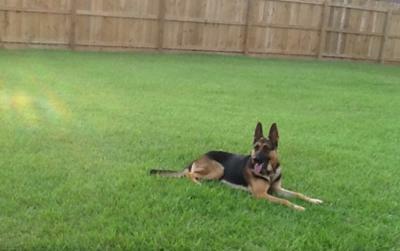 Your right German Shepherds are Amazing, I know too, I have Mia our 4 year Shepherd. Take care of you boy Jake and he will take care of you.